Not a photo of Wizard, but it is one of my favorite photos of horse teeth. Wizard had his teeth floated by our local veterinarian last Thursday. This was my first time seeing a horse’s teeth floated with power tools. I found it to be a positive experience since it was faster than the traditional filing method, plus there is less wear and tear on the horse’s mouth. Wizard was sedated quite a bit in order to keep him still while his teeth were worked on. His head was held in a sling/halter and I stood with him to keep his head straight. He had: hooks on his back molars, sharp edges, and a wave mouth. The wave mouth will need more sessions since it cannot be fixed in one floating. Later that afternoon, Wizard had his feet trimmed by my farrier. It looks like he will be able to stay barefoot for a while. Sounds like Wizard likes life with you. I was stunned the first time I saw a power float. 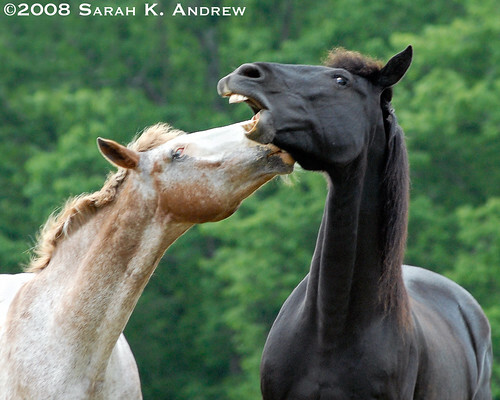 Equine dentistry has come a long way in the past 15 years. Wizard is a lucky horse. Happy trails! i prefer to use power tools only on the gross abnormalities and then do the rest of the mouth with streamline rasps. Less sedation is required which is better for the horse. But i suppose it also depends on the temperament and breed of the equine as to how much sedation is used. i’ve only ever seen power floats used on youtube and i always cringe at the amount of tooth that is ground away, i’m not saying that is what happened with your horse, only what i’ve seen when people have been demonstrating how good these power floats are. Hi Sarah; I am glad all went well with your dental experience. Most of them do. After 26 years of floating teeth and over 41,000 floats behind me, I have not found a reason to switch. What concerns me the most about the new style of dentistry is the use of poor science behind the theories that they apply to the application of floating. In other words, what sounds very good (equilibration, lateral excursion, incisor reduction, TMJ balance) is based on unsubstantiated or poorly studied science and is designed to pray on human’s experience with human teeth at a human dentist. There is no relationship between horse teeth and human teeth. The bottom line is that generations of good anecdotal evidence surrounding the floating technique is rapidly being replaced in the last 5 to 10 years (actually, the change started about 15 years ago) with, well, a song and dance. Unfortunately it sounds good. However, many veterinary chiropractors are starting to see neck injuries 3 to 5 months after the floating from over sedation coupled with neck slings. In addition, hundreds of reports of horses that can’t eat for days, weeks, and even months have been told to me. In the past month I have heard 2 separate stories of horses dying, one after unnecessary tooth extractions and the other from an incisor reduction. My message is simple. Basic hand floating, when done well, is as effective as the new style (over drugging, jacking, bracing, and power tools) and is safer for your horse. As a vet, I am able to purchase this power equipment and use it, but as a horseman and a trained scientist, I cannot. Thank you for letting me have this opportunity to express an alternative to your experience. Again, I am very glad all went well and that your horse is comfortable.